I was first introduced to Bill Moyers by Joseph Campbell. Not literally of course, however much I wish that statement were true. No, I first became acquainted with Bill Moyers through his famous interview with the man of myth himself, Joseph Campbell. 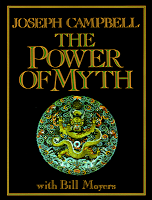 When I first started to read more seriously into world mythology and folkore traditions, the name “Joseph Campbell” continually came up throughout my research. So when I found out that Campbell’s personal library was housed on the Pacifica University campus in Carpinteria, I was thrilled! So one day, nearly five years ago, I went to check it out and ended up speaking with the librarian there for hours about Campbell’s oeuvre and collection. He showed me several of Campbell’s older books with his neatly printed notes in the margins, and I felt I could have spent years amongst the collection of books filled with thousands and thousands of pages of stories passed down through time and space. During my interim I was blissfully lost in words and ideas about how people view the world and their place in it. I came to understand from reading your books that what human beings have in common is revealed in myths. Myths are stories of our search through the ages for truth, for meaning, for significance. We all need to tell our story and to understand our story. We all need to understand death and to cope with death, and we all need help in our passages from birth to life and then to death. We need for life to signify, to touch the eternal, to understand the mysterious, to find out who we are. People say that what we’re all seeking is a meaning for life. I don’t think that’s what we’re really seeking. I think what we’re seeking is an experience of being alive, so that our life experiences on the purely physical plane will have resonances within our own innermost being and reality, so that we actually feel the rapture of being alive. That’s what it’s all finally about, and that’s what these clues help us to find within ourselves. Myths are clues to the spiritual potentials of the human life. When I reached the end of this book, I found and watched the actual interviews as well, and was transfixed by both men and their eloquent display of ideas and concepts about the importance of myth. Everything they spoke about resonated deep within me as true, and over the years both Moyers and Campbell’s works have had a profound influence on my own writing. 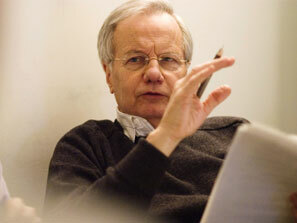 Bill Moyers was born in Oklahoma in 1934 and received a BA in journalism at University of Texas and later a Masters in Divinity from Southwest Baptist Theological Seminary in Fort Worth. He later served as White House Press Secretary to Lyndon Johnson in 1965-1967, and went on to help found the Peace Corps, work as publisher of Newsday, senior correspondant for the documentary series CBS Reports, and senior news analyst for the CBS Evening News. He also produced numerous ground-breaking television series such as Healing and the Mind, The Language of Life, Moyers on America, Faith and Reason, and most recently Bill Moyers Journal. During his long career in journalism he’s received numerous awards including more than 30 Emmys and recently the Lifetime Achievement Award from the National Academy of Television Arts & Sciences, and he’s also written several bestsellers such as Listening to America, Moyers on America: A Journalist and his Times, and most recently Moyers on Democracy. On Sunday I had the opportunity to see the prolific Bill Moyers speak at Campbell hall at UCSB. I went with my roommate Corie and her boyfriend Quentin, and when Matt asked me about the talk when he came home from work later that night, I tried to describe all the ideas and quotes and references Moyers brought up during his talk, and ended up admitting that I was having a hard time describing the experience. Corie walked into the room at that moment and summed up my difficulty perfectly. Despite the truth in this claim, I will try my best to relay what I heard, because it’s a message that needs to be heard and shared with as many people as possible who will listen, and especially so with those who won’t. “About life, our country, this,” she gestured at the television. Moyers admitted that he didn’t really know what to say and was relieved when a hospital attendant called him in for the MRI. But that woman’s question stayed with him, and his talk with us ended up being the answer he wished he’d given the woman that day. In other words, we’re all in this together. So why is it that we continually draw borders between one another; attack and persecute and kill each other; stand idly by as the rich get richer and the poor get poorer? Because that’s what happens when we lose sight of that divinity that is within each of us. When that happens we’re left with individuals looking out solely for their own self interest with a ruthless single-minded pursuit for their own good rather than the good of all. 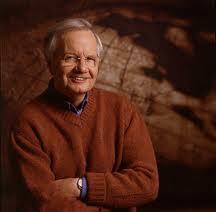 Yet despite this war-torn, dark and dismal world that we live in today, Moyers answered the he is indeed optimistic. But why? At this moment he told us to look to the person on our left, then the person to our right. “There exists within each of us, a hero. Today you are surrounded by heroes. When the truth ‘love your neighbor’ grabs hold of you, and you realize you will sacrifice everything for a complete stranger. That’s a true hero.” He gave examples of heroic efforts by firefighters and civilians during 9/11. Of those involved in the Tuscon massacre. Volunteers who rushed to aid those effected by Hurricane Katrina. All of these moments, Moyers argued, are grounds for optimism. In the darkest moments of our history, true and innate human goodness shine like a beacons. Moyers then referenced the scene in Shakespeare’s play King Lear, when Lear asks his blind lord Gloucester how he sees the world, to which Gloucester answers, “I see it feelingly.” Moyers used that line to tear apart modern politics, all sides, because our current system is more closely resembles a “winner take all” attitude, rather than “for the good of the people”. There is a lack of a desire to recognize the “other” as our neighbor, someone whom we should love and care for. This present system will not work much longer, because we need to honor our responsibility to each other and the greater good; we need to remember to love our neighbor and recognize in each other the divinity and hero within us all. Moyers ended his talk by reiterating that his optimism for our future is justified, but warned: “Don’t put your faith in princes and parties…put your faith in yourself, in your hero within, as well as with people who harbor kindred spirits.” I couldn’t agree more. This past May 2010, Moyers broadcasted his last episode of Bill Moyers Journal on PBS, and his special guest was writer Barry Lopez. For a truly beautiful and hopeful outlook on the world and all humanity, watch this episode. I promise it will be a rewarding 45-minute investment of your time. Every– I think every person– you know, you can go out here on the streets of New York, and walk down the street, pick anybody out of the crowd, and they’ll tell you a story that’ll break your heart. Anybody. It- this happens to all of us. Every single person, somewhere in their life, is driven to a point of despair, where they just want to quit. And they don’t quit. And why don’t they quit? I think they don’t quit because there is a capacity for, a desire for reciprocated love that brings you back to life. It– you know, there is no complete love when you love somebody. It has to be reciprocated. What you’re after is this antiphony. This calling back and forth. “I love you.” “I love you.” “I love you.” That’s what– the possibility of that brings you back to life. “I love my children, therefore, I will get up off my knees when the whole thing looks like it’s going to cave in here.” And, you know, I think that the capacity that people have to recover the sense of what they mean and to say what they mean by the way they live is– that’s why I have faith in humanity. I believe it. I believe that there does exist a divinity and hero within each one of us, I believe we all have the capacity to see the world “feelingly”, I believe in love and goodness and hope; I believe in all these things and therefore I too have faith in the possibility of a better tomorrow. 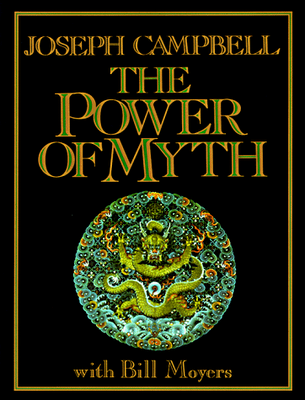 So let’s not forget what Joseph Campbell pointed out when he described the importance of myths: through it all I believe it’s imperative that we share our stories, our life experiences, our myths with each other, because that is what it means to truly be alive. Caroline, wow!! I loved reading your blog. Well written (not to mention insightful). Are you still keeping up with the writing? How are you and Matt doing? Sending you both my best from NYC. How is everything going with you? How is dancing? NY? Married life? !